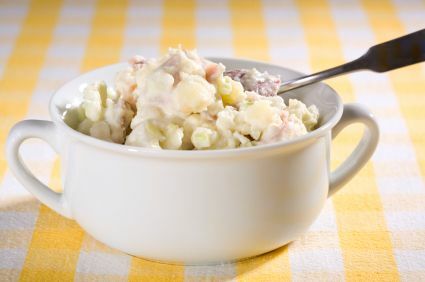 One of the most popular side dishes for picnics, backyard barbecues and family get-togethers is the old standby, potato salad--a general term for any number of culinary combinations that always involve potatoes, but may be as different in composition as chalk is to cheese. Actually, the endless variations are what make building this salad so much fun. You will notice that I said “building”, because that is how I think of making any salad. In the case of potato salad, you start with a good foundation of potatoes and add various vegetables, seasonings and dressings, until you have achieved a culinary delight of taste, texture and nutrition. Is there such a thing as healthy potato salad? If you are watching your weight or just trying to eat healthier, you may think of potato salad as being off limits. However, there are ways that you can make this popular summer dish a better choice for both your waistline and your nutritional status. The key is what you put in the salad and how much you eat. Start with some nice boiled red potatoes--organic if you can get them. I prefer to peel them, but you can leave the skins on, if you scrub them well before cooking. Red potatoes work best for potato salad because they are sweeter and moister than white potatoes. It is not a problem to use white potatoes, but they are flakier and will break up more in the salad, and be blander in taste than their red cousins. Coarsely chop up some celery (again, organic if you can find it) and pickles – sweet or dill—but choose ones with no high fructose corn syrup and with less sodium, if possible. You can even use pickle relish, but you'll lose the texture of the pickle chunks. You can also add, chopped carrots, green olives, black olives, bell peppers, zucchini, fresh or frozen green peas, radishes or any other crunchy vegetables you like. Finely minced onions or chopped chives can also be included, if you are serving the salad to those who are not sensitive to raw onions. Chives are milder than onions, or you can lightly sauté the onions in a bit of olive oil before adding to the salad to make them more digestible. Now that you have all your vegetables prepared and tossed together, you are ready to put on the dressing. You could use just mayonnaise, but a useful tip for making healthy potato salad, is to use half mayonnaise and half non-fat Greek yogurt. (You can use regular plain yogurt, but the Greek yogurt has a better texture for this application.) This adds more protein and calcium while reducing fat and calories. Add some good quality salt such as Celtic Sea Salt and some turmeric spice, garnish with tomato slices, and, if desired, sprinkle with paprika and your salad is ready to serve. The beauty of making potato salad is that the number and variety of ingredients can be based on your taste preference and what you have available. You can use a lot of potatoes or a few potatoes, and build your salad from there. You can use bottled mayonnaise or make your own. If you’re a vegan, you can use soy mayo and skip the eggs. Tips for keeping healthy potato salad healthy. -Choose potatoes that are still firm and remove any green parts, sprouts and dark spots. -Wash your hands before and during preparation to avoid contaminating your salad with bacteria. -Wash vegetables with a food grade veggie wash and chop on a clean cutting board that has not been used to cut meat or that has been disinfected in between uses. -Refrigerate potato salad immediately after preparation and keep it cold until ready to serve. -Store leftovers promptly, or discard remains if the salad is no longer cold. -Use potato salad within 3-4 days. Now that you have the basics you can work on building your own version of this tasty summer classic. If you have a favorite potato salad recipe or ingredient that you would like to share, click on this link, and send your idea to me and I will post it on the site. E-mail me. Click here to go from Healthy Potato Salad page to Turmeric page.